Imola (Italy), Sunday 10 May 2015 – Very different results for the Aruba.it Racing – Ducati Superbike Team riders Davide Giugliano and Chaz Davies in the Superbike races at the Imola circuit today. 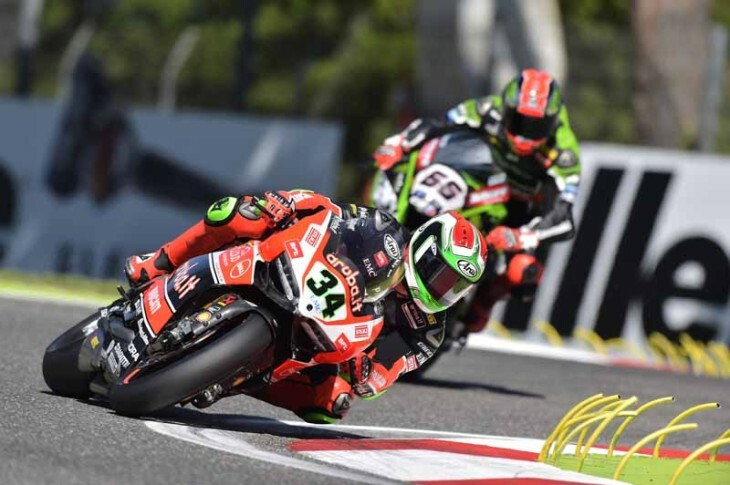 While Giugliano scored a podium in race 1 (third) before finishing round 2 in fourth place, Davies was unfortunately prevented from finishing either race due to technical problems. Race 1 – Both Davide and Chaz made a good start, holding their starting positions (first and fourth respectively) throughout the opening laps. On lap seven Davies moved past Rea into third but a technical problem simultaneously caused him to run off track, from where he was unfortunately unable to continue the race. A red flag brought the race to a halt on lap eleven, and the ‘quick restart’ procedure saw riders returning to the track for a second sprint race made up of just 6 laps. Restarting from the positions in which they had completed lap nine, Davide lined up second on the grid, between the two Kawasakis of Sykes and Rea. Suffering, as was expected, due to a combination of pain and fatigue, the Italian was passed by Rea on lap one but never gave up, showing instead immense determination all the way to the line, which he crossed in final third position, right behind the two Kawasakis. A fantastic podium for the Aruba Ducati rider in his very first race of the 2015 season. Race 2 – Chaz and Davide were lying third and fourth through the first lap, alternating positions behind the two Kawasakis. The factory pair did all they could to catch the two green bikes ahead of them but unfortunately they both gradually lost ground, Davies due to a technical issue and Giugliano due to fatigue. Chaz, despite the problems, worked hard to try and finish the race but was eventually forced to stop on lap 15. Davide meanwhile completed a solitary final phase, bringing his Panigale R home in fourth position, a strong result considering his physical condition after three months of inactivity. As round 5 of the 2015 championship draws to a close, Davies is now in fourth position in the general standings, with 123 points, while Giugliano positions 17th, having earned 29 points today. Ducati positions third in the manufacturer’s standings with 164 points.